On September 9th, Mercedes-Benz Smart launched a flash sales tuan gou on Taobao that generated sales of 205 cars in three and a half hours. 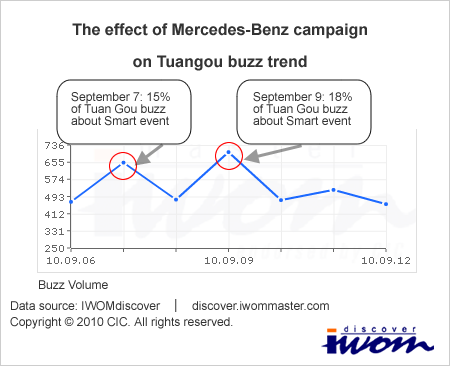 The impact of the buzz can be seen in the fact that 18% of all tuan gou buzz on that day was about this event. On September 7, we could see that netizens were anticipating the event with the event accounting for 15% of the tuan gou buzz in China.